Jordan Behan is the Marketing Manager at Vonigo, a business management and customer experience platform that helps increase sales and streamline the operations of mobile service companies and organizations. In Nashville, Tennessee, two families turn the key to enter their new homes, built by Habitat for Humanity. Thanks to the generosity of donors, families all over the world will be sleeping soundly tonight in homes built by the global charity. Habitat for Humanity was founded in 1976 with a mission to build simple, decent, and affordable housing for families in need. For the work of building, they depend on the kindness of volunteers all over the world. For fundraising, a major part of the revenue that they generate comes from their ReStore locations, where they sell donated building materials, new and used. Especially in larger city centers, these ReStore locations process a lot of volume—with donors requesting pick-ups and dropping off goods that can be resold. It’s a concept that a lot of nonprofits that operate retail locations will be familiar with. 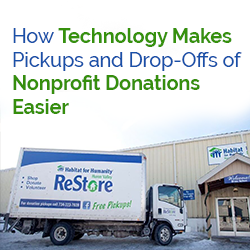 To help them process these donations and issue receipts, many ReStore locations have leveraged technology to save time and effort, both for donors and the teams in the stores. Here’s how. Taking bookings for pickups over the phone takes time, and requires nonprofits to have dedicated team members focused on that task alone. The same is true of emailed booking requests—a time still has to be confirmed between both parties and the back-and-forth can take a non-trivial amount of time. Since the customer has made the booking themselves, the nonprofit’s scheduling software automatically adds the booking to the calendar. It can even suggest the most convenient route for pickups. This way, the teams working at the ReStores can focus on staging the materials in the stores and ringing up sales at the register. Receipts are another way that technology can save time. When the donor processes the booking themselves, the system can issue a donation receipt digitally. This saves both paper and time, which makes the locations much more efficient over the long term. 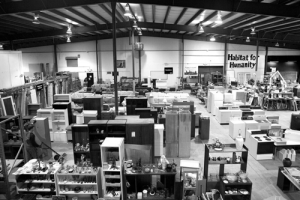 Habitat for Humanity of East Bay/Silicon Valley has take the use of tech at their ReStore to the next level. Donors have the option of entering their items into an online donation form before dropping them off. Or, when donors bring items to drop off, they can also use one of the location’s iPad “kiosks” to process the donation and get a receipt. 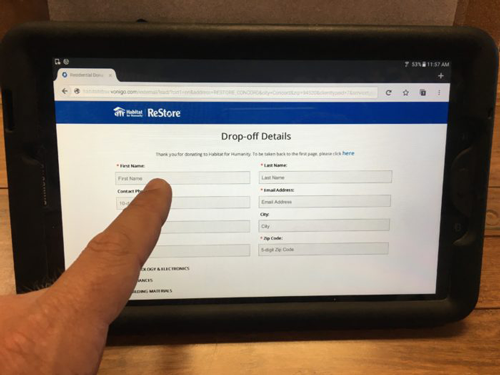 Donors used to have to wait for store staff to record their donations and issue receipts, but the new way saves much more time. “The online form saves our donors time and offers them the convenience of automatically receiving a professional-looking email receipt containing all the details they need for tax purposes,” says Matt Nelson, Project Specialist at Habitat East Bay/Silicon Valley. With so many conveniences it brings to nonprofit retail locations, and an increasingly savvy public who demand convenience, booking and scheduling software can be a major asset in helping nonprofits grow their donations and resulting revenue. Vonigo is a service business management platform that helps streamline operations and increase sales of mobile service companies and nonprofits. Vonigo offers a unified suite of configurable cloud-based modules including; CRM, scheduling, online booking, work order management, estimating, dispatch, routing, GPS, invoicing, payments, reporting, and more all accessible over the internet from any desktop or mobile device. Millions of jobs have been successfully booked and managed with Vonigo.